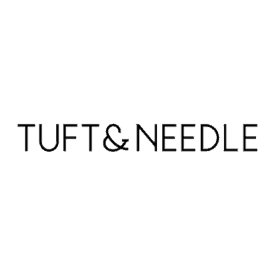 Since its founding in 2012, Tuft & Needle set out to not only improve the whole mattress buying experience, but also prove that you don’t need to spend a fortune to enjoy a good night’s sleep. Now, some of you may already be familiar with the Tuft & Needle mattresses, but if you’re reading this review, it’s probably because you’re wondering what the brand’s bedding is all about. Well, you’ve come to the right place. I’ve just tested every sheet set that Tuft & Needle has to offer, so keep reading to learn whether the Percale Sheet Set, Jersey Sheet Set, or Linen Sheet Set is the best fit for you! With Jersey, Percale and Linen options, Tuft & Needle has a great line of sheets available for any preference! What Are Tuft & Needle Sheets Made Of? Let’s start with the sheet set that offers the most classically cotton feel — the Percale Sheet Set. Nestling into the Percale Sheet Set! These sheets are made from 100% Supima cotton which is widely regarded as a superior, luxurious type of cotton. Why? Because Supima cotton exclusively employs extra-long fibers. The longer the cotton fibers are, the more durable the sheets will be. 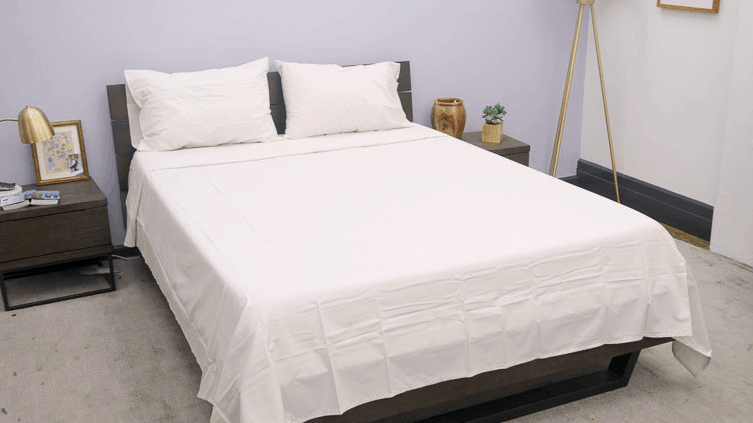 Not to mention, Supima cotton is super soft to the touch, and is exclusively harvested in the U.S.A.
As the name suggests, this sheet set features a percale weave, which is responsible for a really crisp, cool handfeel. In general, percale bedding is more light and breathable as compared to sateen bedding, for example. That said, this sheet set might be a particularly good pick for sleepers who love that soft cotton feel, but also need a little help keeping cool. Of all the Tuft & Needle sheet sets, I found this one to offer the best hotel-bed style. What do I mean by that, you ask? Well, this bedding evokes a fresh, clean, livable look that is complemented by its airy and crisp feel. I’m testing this sheet set in Tuft & Needle’s “sand” color, which is essentially a light beige. Personally, I do get a little bored of white cotton bedding, so I found this sand-colored sheet set to be a refreshing change of pace. This set also comes in a dark grey color called “slate” and, of course, a white option as well. Each Percale Sheet Set comes complete with one top sheet, two pillowcases, and one fitted sheet capable of accommodating mattresses up to 14 inches deep. The pillowcases feature envelope closures which might seem like a small detail but, in my opinion, makes for a much cleaner look. The little extra flap of fabric keeps the pillow securely tucked away in its case (like a letter in an envelope! ), eliminating the option for any of that pillow/tag spillage out of the side. I tested this sheet set on the Tuft & Needle Mint mattress, and while any mattress up to 14 inches deep will do just fine, I did find this mattress and sheet set to complement each other nicely. The fitted sheet snugly adhered to the mattress, and the top sheet offered just the right amount of hangover. Pricing: $75-$125, depending on which size you get. I must add that these sheets are a great value for Supima cotton bedding. Perfect for: Sleepers who love the feel of crisp, breathable, 100% cotton sheets. Moving on to a totally different look and feel, let’s talk about the Jersey Sheet Set. Ready to test the Jersey Sheet Set! Before I get into the feel of this bedding, though, I have to say… these are some very vibrant sheets! 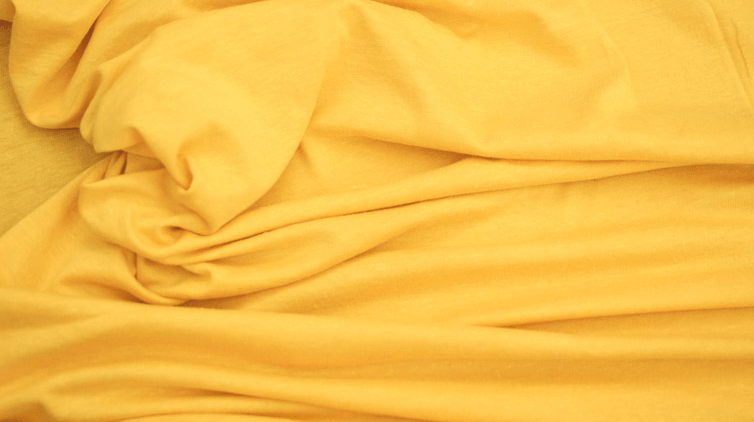 The color of the sheet set I’m testing here is called “marigold,” and as you can see, it’s bright yellow. Tuft & Needle also offers this sheet set in some other unique colors such as “rose” and “periwinkle.” I really enjoy when bedding comes in a wide range of playful colors. Most jersey sheets are made from 100% cotton, and are known for being super airy and light. And while these sheets are definitely both of those things, they feature a special, extra ingredient — Tencel. I think Tencel is a great material to blend with cotton as it’s derived from sustainably sourced wood pulp (hello, eco-friendly bedding), and it’s known for its absorbent and moisture-wicking properties. So, not only are these breezy sheets built to keep you cool, they’re working to keep you feeling fresh and dry as well. 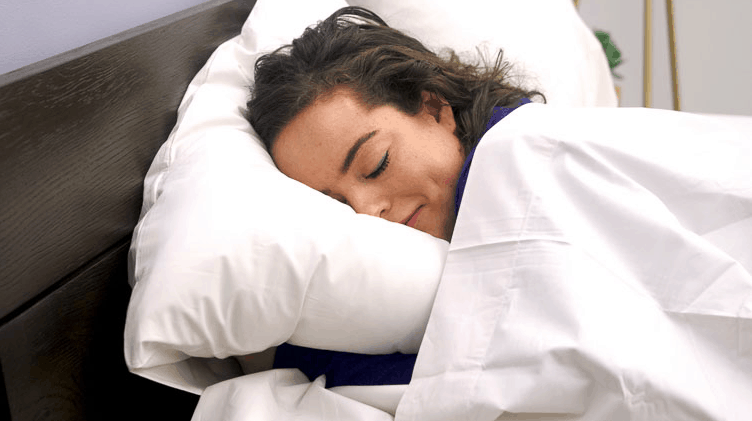 As far as which T&N sheets are going to be best for hot sleepers, the Jersey Sheet Set takes the lead. This bedding lies lighter on the body as compared to the percale and linen sets, and as I billowed these sheets over the mattress, I could feel the air flowing through the material. Between the vibrant colors and the cool T-shirt feel, I’m loving these sheets for summertime. As with the other two Tuft & Needle sheet sets, this set comes with one top sheet, two pillowcases (featuring envelope closures), and one fitted sheet able to accommodate mattresses up to 14 inches deep. I will say, however, that this particular sheet set does not come in white. Sleepers looking for a more classic or subtle bedroom aesthetic might want to test this bedding first to get an idea of how compatible it is with your current decor. Pricing: $60-$80, depending on which size you choose. Perfect for: Hot sleepers on a budget who also love the idea of rolling around in a big T-shirt. Last (but not least) is my personal favorite sheet set from Tuft & Needle — the Linen Sheet Set. Snuggling up with the Linen Sheet Set! These sheets are made from 100% linen, which is derived from natural, sustainably sourced flax fibers. Unlike other linen bedding, these sheets are not blended with cotton or any other textile, so they offer a distinct look and feel that is unique to pure linen. That said, linen fibers are thicker (compare to cotton, for example) and produce a stiffer yarn which creates a texture that’s more coarse, and less smooth. Because of this coarse texture, I will say that I’m not always a fan of linen bedding. However, these particular sheets have been garment washed which leaves them much softer than I was expecting. Garment washing is a textile manufacturing technique that’s used to make fabric feel softer, more flexible, and provide a rustic, casually creased look. But don’t worry, linen lovers — these sheets still offer a gently coarse feel. Now, you might be thinking, “But Sarah, why is this your favorite T&N sheet set?” Well, thanks to the garment washing, I get to enjoy all the fabulous perks that come with linen bedding without having to worry about a feel that’s too rough. Linen is very durable, and it’s also thermoregulating. So, not only is it built to withstand wear and tear, it also adapts to your body’s temperature. If you’re warm, the linen will help wick moisture and dissipate body heat; if you’re cold, it works as a great insulator. Of all the sheets we’re looking at here, these are likely to do the best job of carrying you through the seasons. While linen does tend to be pricier, you get more bang for your buck because you can enjoy them year-round. Additionally, this sheet set comes in at a very reasonable price point for garment washed linen bedding. 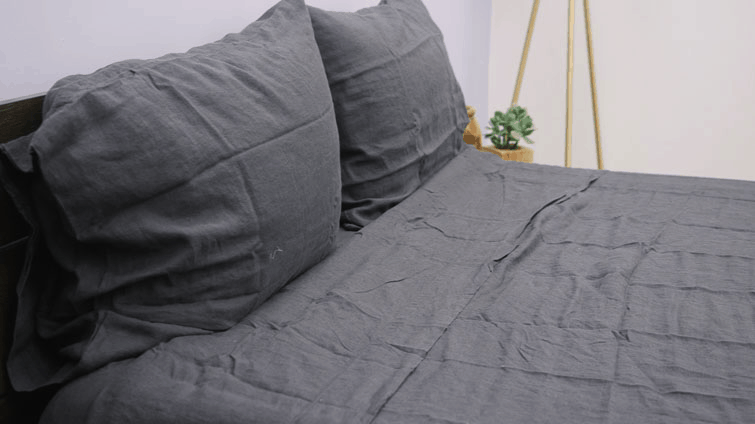 I tested the Linen Sheet Set in a deep charcoal color, but there are four other colors from which to choose. Each sheet set comes with one top sheet, two pillowcases (yay, more envelope closures! ), and one fitted sheet capable of accommodating mattresses up to 14 inches deep. Pricing: $175-$225, depending on the size set that you choose. Perfect for: Sleepers who love the durability and thermoregulating properties of linen, but wish it were softer and more flexible. Which Tuft & Needle Sheet Set Should I Buy? Okay, sleepers. Now that we’ve taken a close look at each T&N sheet set, let’s recap the highlights (and the potential pitfalls) so that you can better decide which one is best for you. Supima Strength — Thanks to its extra-long cotton fibers, Supima cotton enhances the durability of these sheets, making them more resistant to pilling while also improving overall color retention. Light & Breathable — The percale weave of these sheets makes this bedding breathable and light. This set might be particularly compatible with sleepers who love the cozy feel of cotton, but also need a little help keeping cool throughout the night. Hotel–Bed Style — The durability of the cotton combines with the percale weave to offer a crisp, fresh, hotel-bed look and feel that’s cozy and stylish. Up close and personal with the Percale Sheet Set. 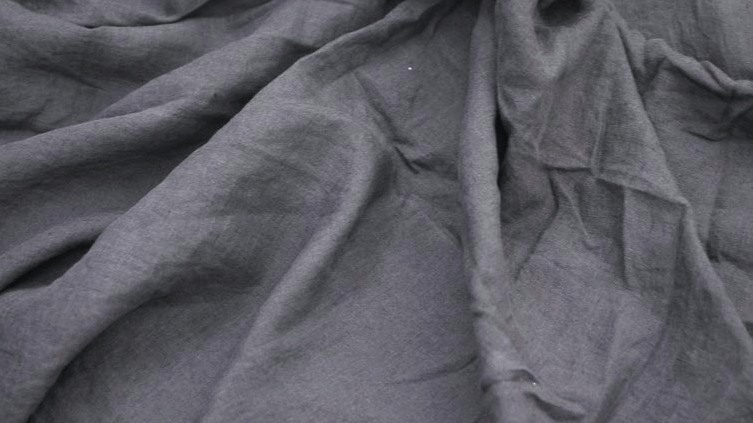 Matte Finish — Because these sheets are percale woven, they are not designed to be lustrous or shiny at all. If you love a matte appearance — great! But if you’re looking for cotton bedding with a little luster, you should browse the sateen bedding options. Not Warm — These sheets are cool and breathable. If you’re looking for something more warming and cozy, I can’t promise that these will get the job done when the cold weather rolls in. Wrinkly — This is common with percale bedding, but these sheets are prone to wrinkling. However, they are machine washable and dryable… so if I were you, I’d pull them out of the dryer as soon as the cycle is finished. Spread them out over your mattress while they’re still warm, and that should help to keep wrinkles at bay. 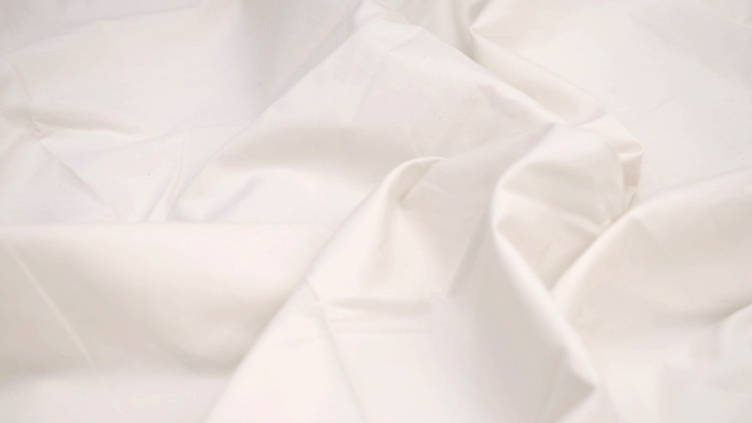 Moisture–wicking & Cooling — The Tencel in this fabric makes these sheets extra absorbent and moisture-wicking. Additionally, these sheets are so breathable; I can tell they’d keep even the hottest of sleepers cool. Soft T–Shirt Feel — Jersey knit sheets evoke this cozy, soft T-shirt kind of feel that’s unique to this style of bedding. If you like the idea of sleeping in a cool and comfy T-shirt, give these a try! Playful Colors & Budget–Friendly — I’m loving that this sheet set comes in a wide range of playful colors. I don’t know about you, but I do get tired of white, beige and grey. Additionally, these are a great value coming in at about $70 for a Queen size set. A close look at the Jersey Sheet Set. Less Durable — Because these sheets are knit and not woven, they are going to be thinner and less durable than the other sheet sets we’re looking at here. They also come with a shorter warranty than the other sheet sets (but they also come with a lower price tag). These sheets are ideal for sleepers on a budget who aren’t looking to get long-term use out of a sheet set. Very Light — Again, these sheets are very light, and have a T-shirt feel to them. If you’re looking for a more substantial, woven fabric, these probably aren’t for you. No Subtle Colors — While I love the color options that come with this set, not everyone will. This sheet set does not come in white or beige. It does come in grey and charcoal, but that’s about as mainstream as it gets. Very Durable — Linen is regarded as one of the most durable fabrics in the bedding game. This sheet set is strong, and built to withstand some wear and tear. Thermoregulating — Speaking of built to last! Linen is thermoregulating, meaning it adapts to your body’s temperature. Feel free to enjoy these sheets all year long. Garment–Washed — If you’re worried about not liking the coarse texture of linen, I totally get that. But because these have been garment washed, they are super soft and more relaxed than the linen you might be used to. A close look at the rustic feel of the Linen Sheet Set. Not Coarse — For some sleepers, linen’s distinctly coarse texture is the basis of its appeal. So, it’s important to note that these are less rough and more soft than linen that has not been garment washed. Casually Creased — The garment washing process also contributes to a rustic, lived-in look that makes this bedding appear creased and sort of wrinkled. Of course, this is a style that not everybody is going to be into. Pricey — Linen bedding usually comes with a higher price tag, and these are the most expensive sheets on this list. However, I must say that this is the least expensive garment washed linen bedding I’ve ever tested. Wash Care — You’ll be glad to know that wash care is the same for each sheet set. Wash on a warm cycle with a mild detergent. Then, tumble dry on low heat. Promptly remove from dry cycle when it’s finished. Warranty — The Linen and Percale set come with a 2-year limited warranty; the Jersey sheet set comes with a 1-year limited warranty. Details about warranties can be found on T&N website. 100–Night Trial — You have 100 nights to test any of these sheet sets. If, during that 100 day period, you decide you don’t like your new bedding, just send it back and Tuft & Needle will refund you! Free Shipping — to all U.S. states except Hawaii and Alaska, which require an additional charge of $30.